Low blood pressure is unable to transfer enough oxygen and nutrients to vital organs like brain, heart, and kidney, which then doesn’t function properly and may get temporarily or permanently damaged. If ever you happen to feel lightheaded or dizzy, you should check your blood pressure as it may have become low. People even faint due to low BP. You need to keep your blood pressure normal not only to protect your vital organs but also to prevent shock which is a life-threatening condition where constant low blood pressure causes vital organs to fail rapidly. These natural home remedies for low blood pressure may help you keep your BP at normal levels. Loss of intravascular fluid is one of the main causes of low blood pressure. There is a fluid space in our blood vessels which is made up of blood cells and serum. A serum is made up of water, chemicals, electrolytes etc. When the total volume in the intravascular space, the space inside the blood vessels, decreases, it causes low BP. This is due to dehydration and bleeding (which can occur due to fatal injuries). Dehydration can occur due to the lesser supply of fluid to the body, profuse sweating like after heavy exercises or due to weather, heat stroke, vomiting and diarrhea. To raise your low BP, you should drink plenty of water and other fluids like fruit juices, herbal tea, fruits with high water content etc.. This will combat dehydration and increase blood volume. When you increase the intake of salt, more liquid gets bound in your body and it causes your blood pressure to increase. Taking a glass of water with salt can immediately increase your blood pressure. If you continually suffer from low BP, increase intake of salt in your diet. However, people having heart diseases or kidney problems should consult their doctor before increasing salt in their diet. Pregnant women should also avoid having excessive salt. Add salt to the glass of water. Drink it to raise your low BP. You may also add some sugar in it to make it an oral rehydration solution. Caffeine can almost dramatically increase your blood pressure. The exact causes of this effect of caffeine on blood pressure are still not known but some experts say that caffeine is capable of blocking the certain hormone that keeps the arteries widened. Once the arteries narrow down, blood pressure increases. One other theory believes that caffeine works on adrenal gland and helps release more adrenaline which leads to raised blood pressure. Whatever may be the reason, caffeinated drinks can raise your BP. Two to three cups of coffee can raise your systolic pressure by 3-14 mm Hg and the diastolic pressure by 4 to 13 mm Mg. Here is a list of some drinks and beverages that contain caffeine in them. Precaution: Too much caffeine may pose health risks for you. Experts believe that up to 400 milligrams of caffeine may be safe for healthy adults. Therefore, do not exceed 4 cups of brewed coffee or two energy shot drinks. Licorice herb has been known to raise blood pressure. The active ingredient in licorice root is glycyrrhizin. Glycyrrhizin is a sweet tasting compound and is similar to a steroid. It can increase the amount of the hormone aldosterone in your body. Aldosterone hormone can retain sodium in your body while eliminating potassium. Sodium, as in salt, can raise your blood pressure. However, because sodium is retained in the body, it may also lead to water retention and give rise to health complications due to deficiency of potassium in the body. Therefore, long-term use of licorice is not recommended. Place licorice herb in a pot. Precaution: If you are diabetic or a heart patient, consult your doctor before taking licorice. Rosemary is considered a beneficial herb for those who suffer from low blood pressure. It works by stimulating your central nervous system to improve blood circulation. People in the past had been infusing rosemary in white wine to regulate blood pressure and poor blood circulation along with a headache resulting from these conditions. At present times also, people use rosemary ointment to massage their chest and raise blood pressure. You may also make your own rosemary infused oil for the purpose. How to Make Rosemary Oil to Raise Blood Pressure? Now place the jar at a location where it will be in sun like on a window sill. Let it be there in sun for 2 days. Strain the oil and massage your chest with this oil. Motherwort herb contains such compounds as alkaloids, flavonoids, caffeic acid, and tannins among others. Caffeic acid is however not related to caffeine. It is an antioxidant which is also an anti-fatigue component. This herb is considered good for heart and nerves and it cures heart palpitations which indicate fast or irregular heartbeats. It actually cures weakened heart. Motherwort is also a mild sedative and an anti-spasmodic. This herb is said to be detrimental for those suffering from high blood pressure. Both, infusion and tincture of motherwort can be used. You can also make motherwort tea. There are some herbs that can raise as well as lower blood pressure. Their main function, in fact, is to regulate blood pressure. Hawthorn is one of such herbs. It is used for both, high as well as low blood pressure patients. Hawthorn contains such antioxidants as oligomeric procyanidins (OPCs) and quercetin. These antioxidants may counter the damage from free radicals that give rise to heart disease. OPCs in this herb may help in strengthening circulation by dilating blood vessels, improving blood flow and protecting your blood vessels from damage. Many studies have shown that hawthorn helps improve symptoms of heart failure. Heart failure is a condition where the heart becomes unable to pump enough blood to the organs of the body, a situation similar to low blood pressure but at decreased levels. How to Make Hawthorn Tea? Place the hawthorn berries in a pot. Cover and let steep for about 10 minutes. You can even use hawthorn leaves and flowers to make this tea. Ginger is yet another herb which is used both for high as well as low blood pressure. Ginger contains various beneficial compounds including certain powerful antioxidants and plant chemicals including gingerol, shogaol, and zingerone. It has anti-clotting, anti-spasmodic, anti-inflammatory, and various other useful properties. It stimulates circulation and increases blood flow which seems to be the reason why it can regulate blood pressure so effectively. How to make Ginger Tea for Blood Circulation? Place the grated ginger in a pot. Strain and drink this ginger tea. Ginseng has been used by Chinese medicine for various health conditions. It is sometimes referred to as an adaptogen, a substance which helps the body to cope with mental or physical stress. Ginseng contains antioxidants that help you get rid of free radicals. Free radicals lead to heart disease and various other conditions. While some studies are still being done to find out the exact effect of ginseng on blood pressure, many experts believe that like ginger, it can also help both high as well as low blood pressure. Place the ginseng root in a pot. Siberian ginseng is different from Asian or American (Panax) ginseng. However, it is also an adaptogen which strengthens the body and increases general resistance to stress. It is also used for heart conditions and high blood pressure as well as low blood pressure. It can also be taken by making tea just like you make with ginseng. It is, however, always recommended to consult your physician before taking any herb for blood pressure. While many people think that aniseed is good for people with high blood pressure, this spice actually has shown to increase blood pressure. The key to this may be the nutritious contents of aniseed which includes such as calcium, iron, copper, potassium, manganese, zinc and magnesium that may considerably increase the levels of iron and potassium in your body. Aniseeds are also a good source of certain essential B-complex vitamins like pyridoxine, niacin, riboflavin, and thiamin. There is a link between B vitamins and low blood pressure. When your body doesn’t get enough folate or vitamin B-12, you may become anaemic. As a result, your blood pressure may drop. While you can always have B vitamins supplements of foods rich in this vitamin, aniseed too is high on B vitamins and you may consider having it too. Use aniseed while cooking. It is a great spice which is used in Asian cuisine for flavor. You can also bake cookies and bread with aniseeds in them. Make aniseed tea by steeping 1 tsp of aniseeds in boiling water for 5-10 minutes. Strain and have this tea. You may also have aniseeds after meals for its another property which makes you digest properly. Just chew some aniseeds after your meal. This is one of the pleasant fragrant ways to raise your lowered blood pressure or lower your high blood pressure. You may either find (or grow) a rose geranium plant or get its essential oil. Rose geranium has many properties. It is an antidepressant, antiseptic, astringent. It can stop bleeding and may also stimulate adrenals as well as regulate hormones. Africans had used this herb traditionally to treat diarrhea and internal bleeding. You can use it to raise your blood pressure. Sit calmly and sniff the fragrant rose geranium plant twice daily. Just inhaling the scent of this herb can do wonders and adjust your blood pressure by lowering or raising it. If you can’t find the plant, buy some rose geranium essential oil and sniff it. You may take 1-2 drops of the oil in a handkerchief or cotton swab and sniff this. You may also add few drops of this oil to your bath water and soak in it or have a bath with it. The flower and the aerial parts of the scotch broom plant have been traditionally used as medicine for various conditions including heart problems, poor circulations and low blood pressure as well as an irregular heartbeat. The chemicals in scotch broom lead to an increase in urine flow and also affect heart rhythm. The chemical tyramine in this herb may be the reason behind raised blood pressure. Very large amounts of tyramine can though cause high blood pressure. However, the body naturally breaks down tyramine so that it may get rid of it which prevents causing high blood pressure. Place scotch broom in a pot. Indian Spikenard or Jatamansi herb has been used by Ayurveda to raise low blood pressure. It has certain alkaloids as well as essential oils in it that give it such stimulant qualities that can stabilize blood pressure. It is considered to be a very good cardiac stimulant that also treats heart palpitation. How to Use Indian Spikenard to Raise Blood Pressure? There are two ways of doing so. You may either have it with some other ingredients or make a decoction out of it. Mix Indian Spikenard, camphor and cinnamon. Strain and have this thrice a day. Poor diet and malnutrition, inadequate production of blood (anemia) and deficiency of certain minerals and vitamins, especially B vitamins are also some of the causes of low blood pressure. Therefore, you need to address this problem too by having a proper diet. Have healthy and balanced diet. Your diet should include lean protein, complex carbohydrates, and lots of fresh fruits and vegetables. This helps in stabilizing your blood pressure. Eat smaller and frequent meals instead of two or three large meals. This helps digestion which further leads to better absorption of nutrients by your body. Drink lots of water and other healthy fluids like fruit juices, coconut water etc. Avoid drinking alcohol as it leads to dehydration. Start having a little more salt in your dishes. Include such foods in your diet as beetroot, carrots, papaya etc. They have all such nutrients that your body needs to combat low blood pressure. Low blood pressure is such a condition that can be easily overcome by bringing little changes in your eating, living and moving patterns. 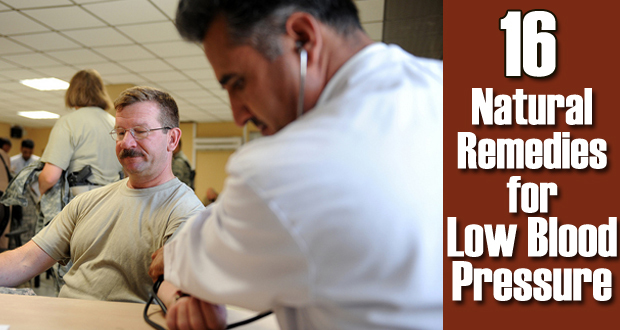 Low blood pressure means your vital organs are getting lesser blood. Thus you need to have rest. Take breaks. As and when you feel tired take rest breaks. Don’t remain standing for too long. This hampers proper blood circulation and also makes you fatigued. When you want to stand up from sitting or lying positions, do it slowly. If you suddenly stand up, you will feel dizzy and may also fall down. When you stand or sit from lying position, it often leads to the symptoms of low blood pressure because standing causes blood to rush towards the lower body parts. If your blood pressure is already low, the condition becomes worse. When you feel lightheadedness, dizziness, or fainting upon standing due to low blood pressure, it is called orthostatic hypotension. Individuals with normal BP can compensate rapidly for the low pressure in such a situation but low blood pressure patients need to exercise caution. Whenever you feel nauseated or as if you will faint, sit down or lie down. Wear compression socks or stockings after consulting your doctor. This prevents blood from pooling in your legs and helps proper blood circulation. Do some light exercises daily. This promotes proper blood flow throughout your body to help control low blood pressure. This is great info, I've had the blurred vision, lightheadedness, cold sweats, even fainted so this will be very helpfull. I am a massage therapist and suffer from wooziness and especially nausea. A problem! Knowing low blood pressure is the culprit makes me more aware of what I must do to handle my symptoms.